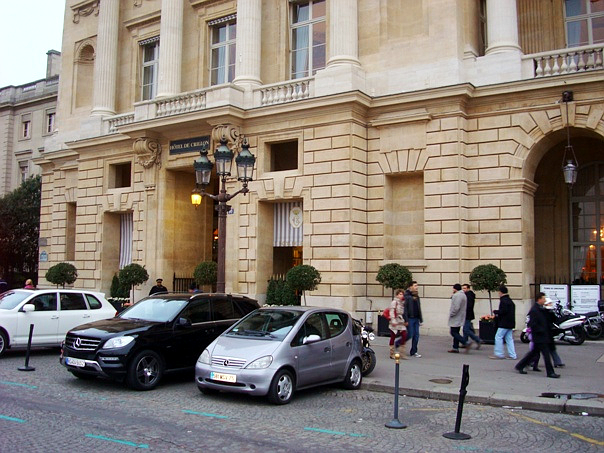 "The traveling side of life"
Hotel de Crillon – number one in Paris? Hotel de Crillon, located next door to the U.S. Embassy and a stone’s throw away from Champs Elysées, is considered one of the best hotels in the city. Maybe even THE best? Well, the jury is still out, we would say it’s probably between Hotel de Crillon and Hotel George V.
Individual service is one of the main selling points of this hotel. When you arrive, you are seated while doing your check-in (keyword “seated”, you don’t stand in a queue at the reception desk). Makes you feel very comfortable after a long trip. The standard rooms are smallish but nicely decorated in a baroque style. At your disposal there are several restaurants (the stylish restaurant Les Ambassadeurs and L’Obé, which is more relaxed) where you will encounter some of the best French cuisine. After your meal, you may want to enjoy a late digestive at the piano bar – it is renowned as a major meeting point in Paris among the powerful and famous. The hotel was built in 1758 and has seen history in the making for over two centuries. During the past decade, it has changed owners several times and, according to the French media, the hotel was bought in 2010 by a member of the Saudi Arabian royal family. Although it is in excellent shape, a few bits and pieces do look border-line shabby and when we asked the staff about it, we were told that the new owner plans to close it down in 2013 for a major refurbishment. One can only imagine how Hotel de Crillon will look after it had been thoroughly polished through. Then it just might beat George V.
Meet Alex, Hanna and Sam - bloggers, world travelers and connoisseurs of better things in life. Tune in for latest updates, hotel and restaurant reviews and a few laughs along the way.